The bands appearances here Dec. 22-23 demonstrated that is has everything any new band needs to propel it to the front ranks of successful rock n rollers. The songs, all of which were written by keyboard man Jim Steinman, are highly imaginative and intelligent. The band was tight and tuneful and the lead singer (who himself goes by the handle of Meat Loaf) is a leathered-voice bear of a fellow one is not likely to soon forget. The group was visually strong due to the interplay between Loaf and female vocalist Ellen Foley. The performance was backed up by the groups debut LP on Epic, a commanding package produced by Todd Rundgren, with musical assists from Edgar Winter, the Philadelphia Orchestra and others. Encore was Two Out Of Three Aint Bad, which was akin to You Took The Words both ballad-oriented with clever story and hook lines. We have been working the Meat Loaf LP for five months now, and we will keep on working it until we are sure we have exhausted its sales potential. This is not a company that gives up on an LP, says Ira Sherman, product manager of the band at Epic Records. 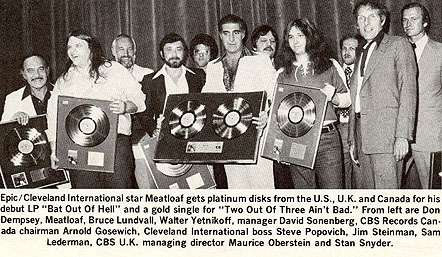 Enthusiasm for the LP, Bat Out Of Hell, on Cleveland International/Epic records got a massive booster shot in late January when Meat Loaf performed at the CBS Records beginning-of-the-year meeting at New Orleans. The band received the most enthusiastic response of any new act in memory. 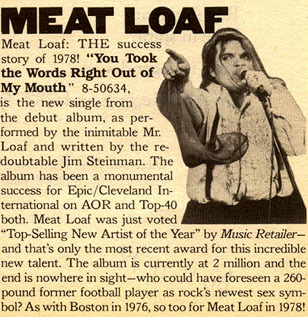 The Meat Loaf LP, which was at the time 128 on Billboards Top LPs chart, Jan. 28, picked up a new head of steam, got a star and moved up to 93 with a star in the March 4 issue. It was not so much that new money was allotted, though we have long since spent our original allocation on the LP, and its not that we ever really stopped supporting Meat Loaf. Its just that the convention underscored our feelings that the company has to be committed to an artist of that kind of excitement, says Sherman. Biggest consumer interest for Meat Loaf so far has been in Cleveland and New York, traditionally the last area rock artists normally break. 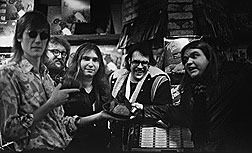 But Meat Loaf sold out four shows at the Bottom Line last December on his first New York appearance. A scheduled headline appearance at the 6,000 seat Palladium was sold out within a week and a second show has since been added. It, too, sold out. 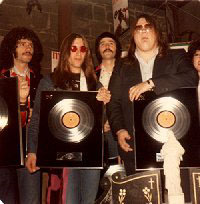 Listeners to WNEW-FM, the citys progressive rock station, voted Meat Loaf as the top new artist of 1977. Songs from Bat Out Of Hell have become a staple at the station rivaling Bruce Springsteen in frequency of radio play. Sherman says that in conjunction with Meat Loafs appearance in New York, Epic is readying a large print, radio and television ad campaign. Print and radio ads both precede and will follow the bands Palladium appearances on Saturday and Sunday. The TV spots will follow the live shows. We have prepared two 30 second spots. We find that they are more effective if they follow the show. We are using film that has been recently done, which should be effective. We are also testing a spot in Cleveland, and preparing a major campaign in Los Angeles, using radio and print, though not TV, says Sherman. Also on tap from Epic is a new single Two Out Of Three Aint Bad, from the Bat Out Of Hell LP which will be released soon. The single is an edited version of a song that appears on the LP. When Meat Loaf (it is the name of the lead singer as well as the band) was interviewed last December, he said he had five booking agents calling him. Since then he has singed to ICM for booking and is now on an extensive tour. The live show is the strong point of this act. The band performs lengthy rock n roll opuses written by Jim Steinman, keyboard player and musical director of the band. He selected musicians who could play the parts he had already written. Visual focus is Meat Loaf himself, a large imposing figure who plays the beast to vocalist Karla DeVitos beauty in the bands sweaty and barely restrained rock n roll show. Meat Loaf, a former vocalist for Ted Nugent, has had extensive theatrical experience. His partnership with Steinman dates back to when both appeared in the Rocky Horror Show cult movie. David Sonenberg, manager of the band, says Meat Loafs health permitting, the band plans to tour through this spring with a major stop at Los Angeles, an area that has totally ignored us, planned for April 1. Except for two dates last November, right after the band was formed, Meat Loaf has not played any support dates. Sonenberg says recent popularity in Canada, Australia and England may mean the band will do a foreign tour after completing its spring dates in the U.S. He claims Bat Out Of Hell has already sold about 300,000 units and is now selling at a rate of 25,000 units per week. He says he hopes this momentum will continue through the spring to force the record company to release as a single the complete uncut version of Paradise By The Dashboard Light, a song nearly eight minutes long. I know thats unusual, but it has happened before. After that we will begin thinking about the second album, says Sonenberg.